President Umaru Yar’Adua met with China’s Hu Jintao in Beijing to discuss oil and other economic agreements. Details of the deals signed were not immediately available. Trade between Nigeria and China reached 3.13 billion dollars in 2006, up from 1.1 billion dollars in 2001, according to the latest data from China’s commerce ministry. Aside from oil deals with Nigeria, China has helped the country build railways and hydroelectric dams, while last year it launched a telecommunications satellite for the nation. Chinese media last month also reported that state-controlled China Development Bank was in talks to buy a five-billion-dollar stake in Nigeria-based United Bank for Africa. (President) Biya announced eight weeks ago he might change the constitution to stay in power when his term ends in 2011. Critics say Biya, 75, could use his party’s majority in parliament to make the constitutional modifications. “Biya has gone too far, he must go,” shouted one demonstrator in Yaounde. Others chanted: “We’re fed up”. The USS Fort McHenry, AFRICOM’s African Partnership Station, is in the neighborhood in Cameroon training and partnering with the Cameroonian military. This training could be just in time to help “stabilize” the situation in Cameroon. On whose behalf might potential “stability operations” be engaged? Back in the United States, Immanuel Wallerstein writes a note of cautious optimism about the possibility of an Obama presidency.
. . . the U.S. military of involvement in the heroin trafficking from Afghanistan to Europe. The Vesti channel’s report from Afghanistan said that drugs from Afghanistan were hauled by American transport aircraft to the U.S. airbases Ganci in Kyrgyzstan and Incirlik in Turkey. Russia today has about six million drug-users – a 20-fold increase since the collapse of the Soviet Union and a huge figure for a country of 142 million people.
. . . Musto’s concerns went unheeded.
. . . as the CIA knew too well from experience, nothing could rival the drug trade as a reliable source of big money for covert warfare. Drugs are the quickest easiest way to fund covert operations. If the US military is once again involved, it is only a matter of time before covert military operations are expanded around the globe, based on available revenues. With the militarization of US policy in Africa that AFRICOM represents, this is a very worrying development. US officials and employees have been involved in the drug trade in Latin America, in Southeast Asia, and in Afghanistan. With the current problems West Africa is facing with drugs, mostly the transshipment of cocaine, it would not be a great leap for military, or for mercenary corporations in Africa to fund their activities, and look for profits in the drug trade in Africa. Drugs and guns are the same trade, used as currency for each other. 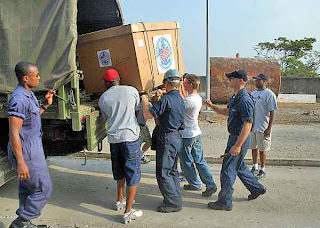 Bush slashed UN peacekeeping money for Africa just before visit is up at the African Loft. Just before Bush left to play at being benevolent uncle in Africa, his administration cut funding for UN peacekeeping in African countries. On the eve of President Bush’s trip to Africa, his administration has decided to drastically cut money for United Nations peacekeeping missions in war-torn countries there. In war-torn Liberia, which President Bush will visit on his trip, the White House has proposed spending $56 million less on the U.N. peacekeeping mission there than it did last year. Bush . . . visit(ed) Rwanda, which is still struggling to right itself after a devastating, years-long civil war took the lives of millions. His administration’s budget proposes cutting $5 million (from the UN tribunal in Rwanda.) . . .
Obviously peace is way too important to pay to restore it.
. . . undertake a wide range of diverse projects, including setting up operational bases to support peacekeeping operations in hostile environments, military training and to providing a range of technical assistance and equipment for African militaries and peace support operations. 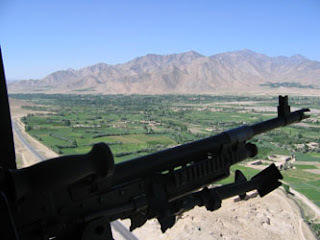 And the mercenaries are salivating at the Bush administration plans to hire more and more mercenaries, private military and security contractors, to accomplish Bush aims in Africa. In October (2007), leaders in the private military security industry — ArmorGroup, DynCorp, MPRI, and several others — gathered at the Phoenix Park Hotel near the Capitol for the annual three-day summit of their trade group, the International Peace Operations Association. Panel speakers and members of the audience debated the future of nation-building efforts in failed states.
. . . handing out his business card that day, Army Lt. Col. James Boozell, a branch chief of the Stability Operations/Irregular Warfare Division at the Pentagon, said that the U.S. military was in fact experiencing a “watershed” moment in its 200-plus-year history — nation building was now a core military mission to be led by the Army. Boozell adds, however, that the Army can’t possibly raise up failed states without . . . of course, private security contractors . . . — boom times for nation building are here to stay. They may need a lot more states to “fail” in order to keep the PMCs busy with new contracts. Vijay Prashad and Mahmood Mamdani tell us how the US and the EU previously cut funding for African Union peacekeeping efforts in Sudan and Darfur. The AU was actually having some success in reducing violence. Bush does not want that success. By cutting UN peacekeeping funds now, Bush is trying to prevent an indigenous African force, or an international agency, from succeeding in peacekeeping. For a time the African Union was able to stabilize the situation, although it did not succeed in crafting a political solution to the problem. The African Union, created in 1999, has neither the financial ability to pay its troops nor the logistical capacity to do its job. 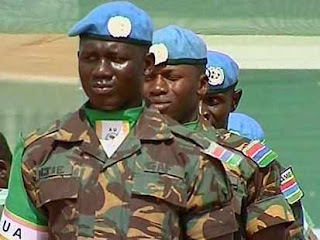 The European Union, who paid the troop salaries, began to withhold funds on grounds of accountability, and it gradually killed off the peacekeeping operations. Columbia University Professor Mahmood Mamdani (who is one of the world’s leading experts on contemporary Africa) says of this, “There is a concerted attempt being made to shift the political control of any intervention force inside Darfur from inside Africa to outside Africa.” In other words, the U.S. and Europe are eager to control the dynamic of what happens in Africa and not allow an indigenous, inter-state agency to gain either the experience this would provide or the respect it would gain if it succeeds. The African Union has been undermined so that only the U.S. can appear as the savior of the beleaguered people of Darfur, and elsewhere. Undermining the UN, and paying mercenaries instead of the UN, does not save money. This is not frugality. Private military contractors, PMCs, are in business to make money, and they are still very much on the Bush agenda. Of course the costs for PMCs can be reduced by using conscripts and child soldiers. And PMC profits can be increased by dealing in contraband. There are plenty of precedents. I see these possible reasons why the Bush administration has cut UN peacekeeping funding. Prevent African or international solutions to African problems. Maintain the US as the only ones capable of solving violent unrest in African countries by preventing indigenous or alternative solutions. Provide more jobs and contracts for corporate cronies, the private military contractors. Prevent oversight, avoid US law and international law that might apply to US activities in African countries. Continue an intentionally destructive policy of undermining the UN. 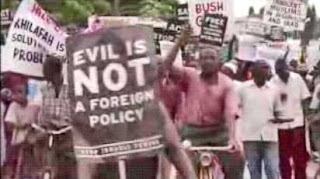 Photo from a demonstration against Bush in Tanzania. I always get a laugh or a smile when I look at this sign. 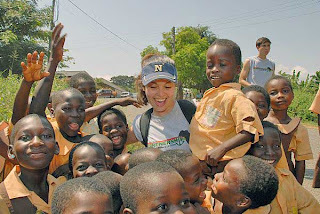 See pictures of Bush in Ghana here. Lots of stories coming out in the last few days about how AFRICOM headquarters will stay in Germany. In many ways this is a huge win for Africa. In other ways this is just point one for Africa in a preliminary skirmish. I think the Bush people have been watching too much western media coverage of Africa and did not realize how canny and tough their target is. And they certainly did not confer with anyone in Africa before creating AFRICOM. The US press was all about how much Africans love Bush. The African press has not been quite so flattering. And I’m not hearing it from anyone I talk to in Ghana. A lot of Africa has been pro American in the past. Bush and his policies have really turned that around. 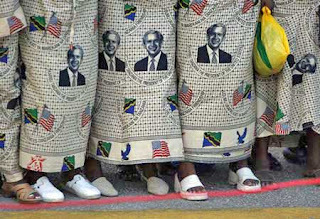 There is good writeup A Critique of Bush’s Africa Agenda over at the African Loft. Contrary to the propaganda from the Whitehouse, their embassy in Accra and their surrogates in the Osu Castle that President Bush is here as the benevolent father who cares about us and is here to show concern about malaria, HIV/Aids and his Millennium Challenge Account – all these are but a smoke screen. As Bush comes for our oil, he has the added PR advantage with the huge CNN and Fox networks behind him of being portrayed as the Bush who has a human side and cares about victims of malaria and HIV/Aids as he attempts a last minute face saving. The gullible ones may believe this PR stunt but not the majority of people around the world who have now read through the lines of America’s selfish foreign policy and will take to the streets in wild jubilation the day President Bush hands over not only as president of America but also as the tormentor-in-chief of our world. Under the circumstance, it is he who needs us badly. Help will only come from within when we take the right decisions, break off from our present neo-colonial mentality and demand of our leaders not to sell us to the highest bidder. In Ghana Bush arrived about 7pm Tuesday. Heads of state are generally greeted in Ghana by playing the guest national anthem and the Ghana national anthem. There was a band, an honor guard, a 21 gun salute planned, and the drama troupe and a dance troupe to greet him. Bush skipped them all and rushed off to where he was staying, and mostly kept away from people throughout his visit. One person remarked that an executioner is always afraid to sleep with his head up. In comparison, as everyone said, when Clinton visited, everyone could greet and touch him. you will find discussion of AFRICOM, bases, and US military programs in Ghana and Africa below the photos. For the present, the headquarters of AFRICOM will remain in Stuttgart Germany. It is a triumph that African countries have held the line, and successfully opposed an AFRICOM headquarters on the continent. However, AFRICOM is just as dangerous without an actual headquarters in Africa. With Bush visiting Ghana this week, it is worth looking at exactly what Bush, AFRICOM, and US intentions are in Ghana and West Africa. Oil is the main source of US interest. The US already gets more oil from Africa than from Saudi Arabia, and wants even more. The quality and quantity of African oil, and the ease of working on offshore deep water rigs, away from the population, make African oil particularly desirable. Ghanaians should make no mistake. There is already a US military presence in Ghana. It occupies what the US military sometimes calls “lily pads” or “cooperative security locations”. You probably know where some of these are. And this presence will grow. 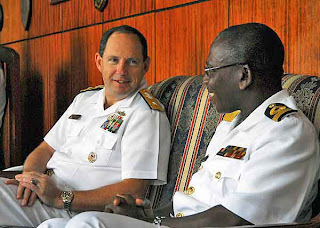 It is already growing through interactions with the African Partnership Station, the APS, the USS Fort McHenry that has been visiting Ghana and sailing along the Gulf of Guinea in 2007 and 2008. Economic aid, development projects, or other forms of indirect compensation . . . may also be given with military considerations in mind. For example . . . constructing dozens of roads, piers, wharfs, bridges, and other infrastructure projects in the very areas where US troops have been deployed. . . . many of these infrastructure projects support US military mobility; at the same time, they have also proven very useful in gaining local public acceptance for US military presence. For the Special Forces, especially, the infrastructure and humanitarian projects are seen as instrumental in “winning hearts and minds” in the aim of getting what they call “actionable” intelligence. The collapse of the Portuguese colonial forces in Mozambique, Angola, Guinea and Sao Tome and the collapse of the white racist military forces in Rhodesia gradually led to a rethinking by the US military. During this period the US had labeled all African freedom fighters as terrorists. When the US was allied with Osama Bin Laden and Jonas Savimbi, Nelson Mandela had been branded a terrorist. there are scholars who have argued and presented evidence that the government of the United States has been “fabricating terrorism” in Africa. The Bush administration plans to employ mercenaries to do much of the business of AFRICOM, follow the link for more details. The “private contractors” mentioned above mean mercenaries. And the “partnerships” AFRICOM is promoting are intended to coopt African militaries so that they will do the dirty work in any fighting the US wants conducted in Africa. That said, the US military provides the best military training you can find anywhere in the world. It is worthwhile to take the opportunity to learn from it. Most of the US soldiers and sailors are good people with excellent intentions. This does not necessarily apply to the contractors. At the same time it is important to keep in mind, that when you train with them, they will be learning a lot of information about you, your country, and your military organization. The intentions of Bush and his cronies, who give the orders, are not benign, and they intend to use the military to impose their goals by force where they see the “need”, and impose a 21st century version of colonization. You can read here for the documentary trail of their plans and intentions.
. . . the Bush Family and their allies and cronies represent the confluence of three long-established power factions in the American elite: oil, arms and investments. These groups equate their own interests, their own wealth and privilege, with the interests of the nation – indeed, the world – as a whole. And they pursue these interests with every weapon at their command, including war, torture, deceit and corruption. Democracy means nothing to them – not even in their own country. And this is the danger in dealing with them. They are a powerful force for corruption and exploitation, even as they preach democracy and “free” markets. Below is a list of US military programs in Africa that will come under AFRICOM, and countries where they are active. You may have already encountered some of these in action. I know ACOTA has already been active in Ghana. For more detail about these see Africom: The new US military command for Africa. TSTCI Africa Contingency Operations Training and Asssistance Program (ACOTA) (formerly African Crisis Response Initiative) (ACRI)) Part of “Global Peace” Operations Initiative (GPOI). Areas of Operation: Benin, Botswana, Burkina Faso, Ethiopia, Gabon, Ghana, Kenya, Malawi, Mali, Mozambique, Namibia, Niger, Nigeria, Rwanda, Senegal, South Africa, Tanzania, Uganda, Zambia. 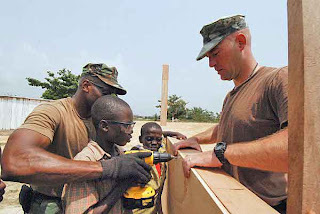 International Military Training and Education (IMET) program brings African military officers to US military academies and schools for indoctrination. Top countries: Botswana, Ethiopia, Ghana, Kenya, Nigeria, Senegal, South Africa. Africa Center for Strategic Studies (ACSS) (formerly Africa Center for Security Studies) Part of National Defense University, Washington. 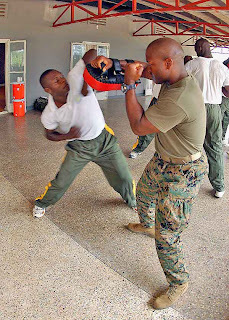 Provides indoctrination for “next generation” African military officers. This is the “School of the Americas” for Africa. All of Africa is covered under the Foreign Military Sales Program which sells US military equipment to African nations via Defense Security Cooperation Agency. Top recipients: Botswana, Ethiopia, Ghana, Guinea, Mali, Nigeria, Senegal, South Africa, Zimbabwe. Joint Task Force Aztec Silence (JTFAS) Targets terrorism in West and North Africa. Joint effort of EUCOM and Commander Sixth Fleet (Mediterranean) Based in Sigonella, Sicily and Tamanrasset air base in southern Algeria Gulf of Guinea Initiative. 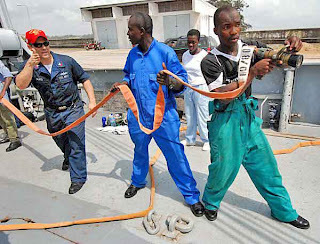 US Navy Maritime Partnership Program Trains African militaries in port and off-shore oil platform security Angola, Benin, Cameroon, Congo-Brazzaville, Congo-Kinshasa, Equatorial Guinea, Gabon, Ghana, Nigeria, Sao Tome & Principe, Togo. Tripartite Plus Intelligence Fusion Cell Based in Kisangani, DRC to oversee “regional security,” I.E. ensuring U.S. and Israeli access to Congo’s gold, diamonds, uranium, platinum, and col-tan. Congo-Kinshasa, Rwanda, Burundi, Uganda. United States Base access for Cooperative Security Locations (CSLs) and Forward Operating Locations (FOLs) U.S. access to airbases and other facilities Gabon, Kenya, Mali, Morocco, Tunisia, Namibia, Sao Tome & Principe, Senegal, Uganda, Zambia, Algeria. Africa Regional Peacekeeping (ARP) Liaison with African “peacekeeping” military commands East Africa Regional Integration Team: Sudan, Ethiopia, Somalia, Uganda, Kenya, Madagascar, Tanzania. North Africa Regional Integration Team: Mauritania, Morocco, Algeria, Tunisia, Libya. Central Africa Regional Integration Team: Congo (Kinshasa), Congo (Brazzaville), Chad. South Africa Regional Integration Team: South Africa, Zimbabwe, Angola. West Africa Regional Integration Team: Nigeria, Liberia, Sierra Leone, Niger, Western Sahara. I posted Bush in Africa 2 over at the African Loft. As Rwanda braces up for President Bush’s visit . . . the security agencies have detained hundreds of people in a security operations mounted across the country ahead of the visit, APA learns here Saturday. The military source said the operation is being mounted by the national police force and military police with the help of the United States secret service.
. . . for some of us, it is a huge embarrassment when the number one war criminal in the world, who should be facing charges in the Hague, showers praises on our leader.